Use creativity, beauty, and imagination. We have a “Food Rules” poster in our kitchen that I love. It’s beautiful, practical, simple, and true. It used to live in our dining room, but I’ve recently moved it into the kitchen so I can see it more often throughout the day as it offers gentle reminders how we as a family can tread more lightly when it comes to buying, prepping, and consuming food in our everyday lives. These rules were crafted out of necessity several decades back, however with the pressing and alarming environmental concerns we have today, they are more important than ever. While I was roasting a big batch of vegetables that were about to turn and become compost, the idea came to me “Why not create “Toy Rules”? For you, for me, for family members who need a bit of direction when it comes to gifting and buying toys for both your home and theirs. Ideas have their way of tumbling out when I am doing things at home and making things with my hands, and this time was no exception. In keeping with Tidy Tuesdays, here are some simple and straightforward “Toy Rules” you can use when it comes to bringing toys into your home and storing them with care. Feel free to pass this along to others or share with your partner as a helpful guideline to follow if feeling stuck when it comes to supporting your little one’s play. Buy it with thought | When it comes to purchasing and bringing toys into your home, be thoughtful. What I mean by this is, don’t fall into the consumerism trap by buying whatever is on trend, on sale, on Instagram just because. Consider materials that are made from the earth, the opportunity for open-ended play, the quality of materials used, and how imaginative it is. Buying with thought means taking the time to consider the who, where, what, when, and why of each item. Who is going play with this toy? Where are they going to play with this toy? What will this toy do for their play? When will this toy come into our home? And why is this toy worth the purchase? Taking time to ask a few simple questions before blindly making a purchase is how you can weave more mindful living into this area of your life. Make the storage beautiful by using natural fiber baskets, wood bowls, wood boxes, and open storage like a wood bookshelf. Store the toys at kid-level making it easy to access throughout the day. Separate toys into various bins and baskets rather than using one big basket to sort and store. 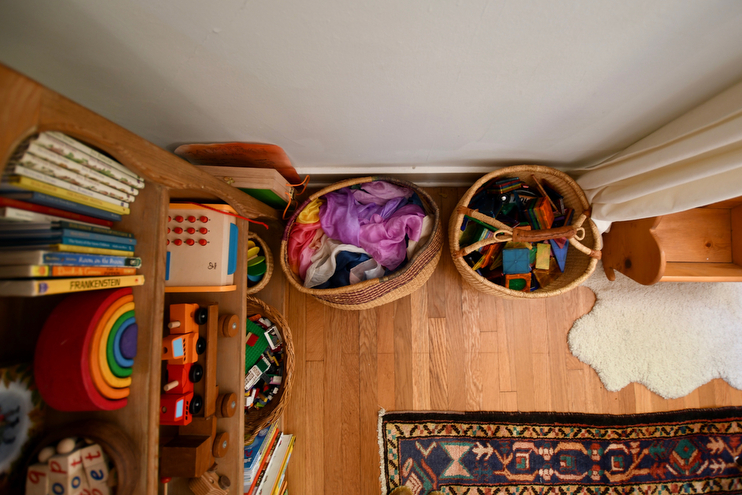 This kind of one basket toy storage is overwhelming and will likely result in less play. True, it’s easier clean up to toss everything into one giant bin, but it makes play significantly more challenging when blocks and train tracks and cars and silks are all jumbled up. Consider rotating toys a few times a year to keep things fresh and from overtaking your home. When the kids are given gifts for Christmas or birthdays, I’ll tuck a few away for a rainy day and they end up having so much more fun with that particular toy now that it’s newness is isolated, as opposed to being lost in the chaos of many presents. Lastly, keep storage simple and natural. Source second hand as much as possible for this, and store items as if you would see them on display in a small shop. The more care you offer the items in your home, the more caring the overall environment will become in general. Use less plastic | Yes, wood toys are everywhere and quite trendy right now, but this is a trend worth following. Besides the glaring fact that plastic was not made to decompose (!!!!) most plastic toys are what’s considered “fixed”, meaning they are likely to have one specific play function. When a toy has one specific play function, it tends to be limited in terms of freedom of creativity and imagination. Think about all the ways your kids have played with a single stick. It can be a wand one moment, and a paint brush the next! Now think about a plastic item that was cool for two days and now collects dust in the corner. See? Also, natural materials are much more sensory based than toys manufactured in factories with chemicals and machines. They are homier, more beautiful, sturdy, and often times, well made to last for years and years. My kids play with the wood blocks my brother played with, and the wood barn my papa made more than 40 years ago! You might end up spending a bit more upfront, maybe not, but this rule will help you save a lot of energy, time, and money in the long run. Buy from small shops | Oh, Amazon. As much as I love it, I am trying really hard to continue supporting small shops when it comes to purchasing goods for our home, toys included. When you buy from a small shop, you are supporting a family, a maker, and a community. You won’t get prime shipping, but you will make a considerable difference in the world by this very important decision. I love knowing that many of our toys and play items were made with quality and care in mind, making our home even more homier. One0-in-one-out | This rule is one that goes hand in hand with embracing a minimal lifestyle. A few times a year I go through and sort all our kids toys and get rid of the ones that are broken, never played with, doubles, or are no longer age appropriate. 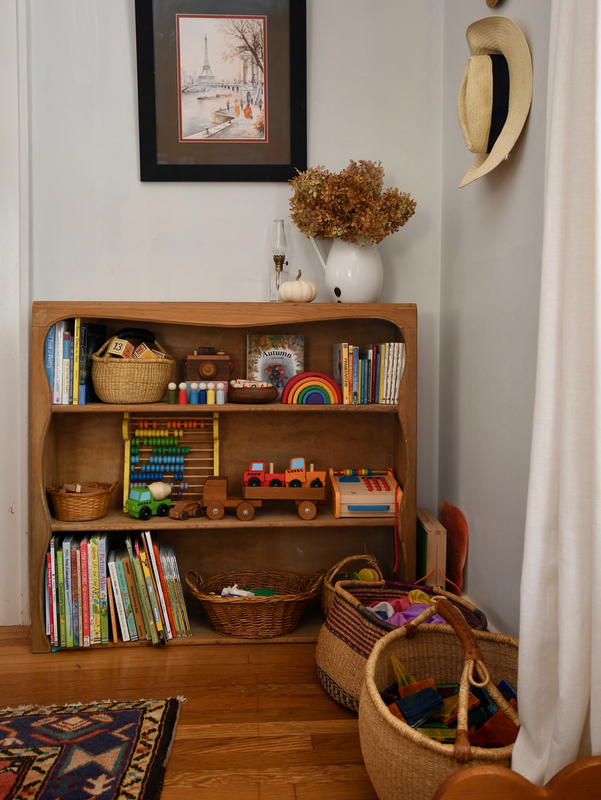 It keeps the toy clutter at bay, and also gives me an opportunity to keep things simple and orderly in our home. However, one thing we’ve been doing a lot more of is having the kids donate or give away a toy whenever they bring one home. This one-in-one-out rules teaches many valuable lessons, while helping keep the toy situation from taking over and looking like an hoarder’s daycare. 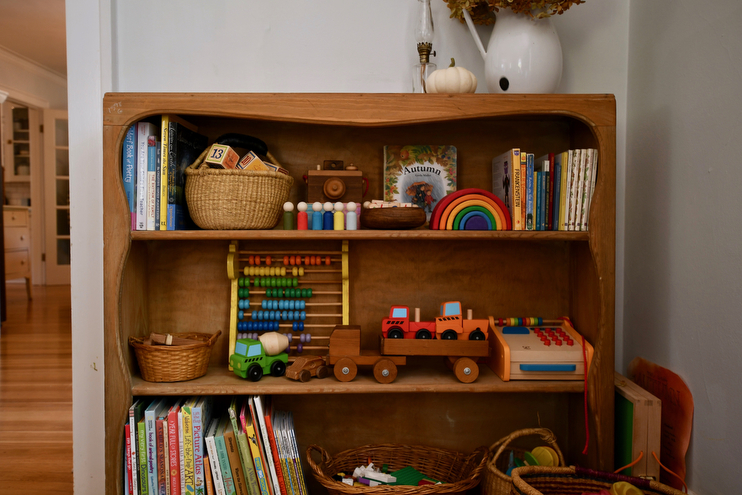 Less is always more when it comes to creativity, and I promise you you’ll see more engaging play if you keep your toy corner or area simplified and organized. Play near the family |We used to have toys all over the house, and while it’s hard to keep them from creeping upstairs and into our loft, the good majority of our toys now live in our living room. Above is our main toy corner with a wood bookshelf full of toys, including baskets of cars and legos, baskets nearby on the floor for silks and Magnatiles, and then a big wood box I decided to use for their wood blocks and train tracks on the other side of the room. Stella does have a few of her specialty toys in he room, and so do the boys, but most of our toys are in one general space – one we all spend a lot of time in together. I used to have a toy nook in the loft, but because I am downstairs far more than up, it made much more sense to relocate that to where we are most does, which is in the living room. This encourages play near everyone else, and means our toys get a lot more use and lovin’! Don’t overbuy | Perhaps the most important rule you need to know when it comes to toys is this one: don’t overbuy. What do we actually need? And what do we need to be happy? Each other. Nature. Snuggles. Food. Connection. And very few toys. Truly. Andrew and I have decided that we are giving the kids one main gift from Santa and then getting a few small but meaningful stocking stuffers this year. We are then going to tell our family to keep gifting very simple, preferably experiences like zoo passes, theatre tickets, and other cultural experiences we can do as a family throughout the year. This can be hard, because it is fun giving toys, but remember that overbuying means less and less play with each and every toy. Imagine walking into your office and seeing stacks and stacks of books, papers, and other various desk supplies all over the place. Would you more or less inspired if things were decluttered? Minimal? Orderly? Beautiful? Simple? I know I would be, so I try to keep that in mind when it comes to toys in our home as well. Play is the work of little ones, and it’s important we honor their play in a way that offers freedom and creativity, and not inhibits it. What “Toy Rules” would you add to this list? What guidelines do you already follow in your family? Are you nervous for the upcoming holidays with regard to toys and how to manage everything? My daughter turns 5 tomorrow and while my husband and I have followed most of your rules fairly well for this year’s gifts, I have a sibling who likes to give plastic toys. Many times we just hide them away to be donated before the kids know about them. And even if I request gifts made of natural materials, my sister likes to buy cheap. The best compromise I have come up with is to find some portion of my sister’s gift that I can give the kids, but limit their play with it and rotate it out of the toy cycle until it is forgotten. I will consider asking for cultural experiences this Christmas and see if that helps, but any tips from you or readers about how to handle gifts from family would be great! I am so with you on almost all of these! They are important reminders, especially before the holidays come with all the S T U F F. But for our family, we actually find the “Play near the family” rule to be quite opposite. We have the luxury of a playroom and it is upstairs at our house, by the children’s bedrooms, away from our common space. By keeping all of the toys there, it creates an oasis for early morning play and extended quiet times. Of course, some of the toys end up downstairs, but only the ones they are most interested in at the moment. For our family, we’ve found that this encourages focused play and more time outdoors. Since the playroom is away from our daily family space, the kids engage in more imagination, social and physical play time, with toys being a special quiet practice.